Hey! So I had won a free luxury ride by Ola Cabs, as a promotion for their newly launched service in Mumbai! The best part about Ola Cabs has to be their awesome app for Android & iOS. It is ingenious, accurate and just mind-blowing. It uses your phone's GPS to pick up your exact location, tells you if there is a cab nearby, or how far away it is. And then you can choose to book now or later. 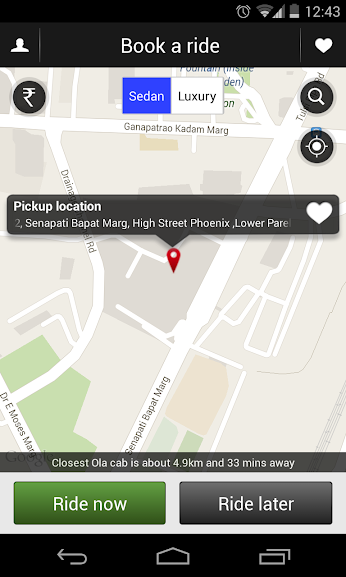 No more hassle of calling a cab service and giving your location & time! I used to hate having to make them understand addresses and landmarks. I mean, I don't know the road's name or pincode when I am shopping at a mall! Since I had won a luxury ride, a uber cool BMW in white was booked for me! As soon as I selected "Ride Now", I got an email confirmation and also, the map showed where the cab was right then! It reached bang on time and showed that cab has reached. The driver called and we went. The driver was courteous and did not talk much like some drivers tend to. I like that. We reached our destination in half an hour. On reaching I got an email invoice that has all details like distance travelled, time taken etc. I saved Rs. 564/- by availing this free ride! (Yes, the e-invoice told me that too!). Verdict- The app is hassle free and awesome! It makes booking rides so efficient! I love Ola Cabs and am glad they're now in Mumbai! Very wonderful experience you had and thanks a lot for sharing with us and the GPS service should be used by all the cab service providers..!